We provide a simple yet powerful email integration with email templates through your own email account. You can send email from the lead view. Choose the ‘E-mail’ tab right above the comment field and action buttons when you are looking at the lead. Sending e-mail from within myphoner is as simple as selecting a template from the predefined set of e-mails; myphoner will merge the relevant contact information from your lead. 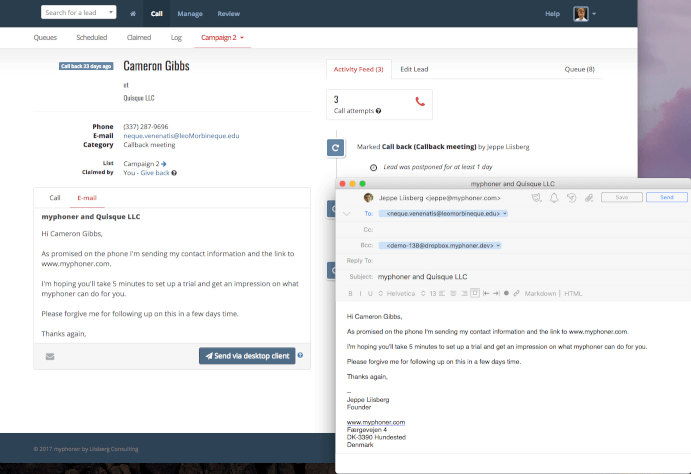 Sending email directly from the lead view in myphoner. If there are no emails to choose from, you or your manager will need to add one or more templates from the list configuration page. 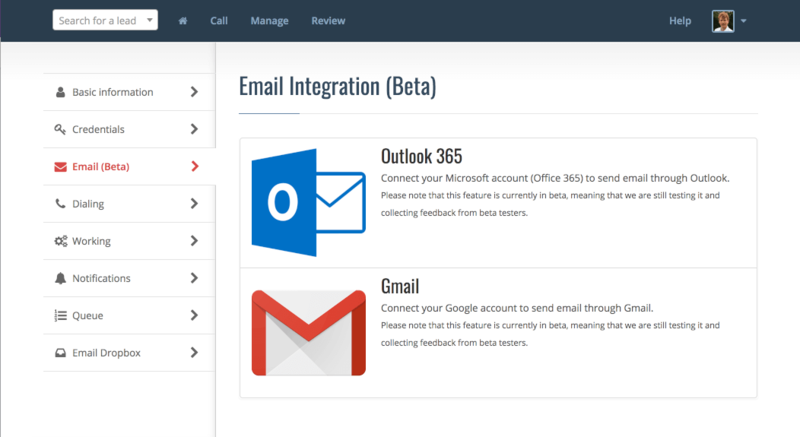 If you are using Gmail or Outlook 365 for sending email, you can connect your email account to myphoner and send directly through that when working your queue. To send emails using Outlook, you need to connect your Microsoft account to myphoner. Go to your personal preferences and click on ‘Outlook 365’ under the ‘Email’ tab. Sender address: Please note that you'll be sending email from your outlook email address, not the email address you registered with myphoner. To send emails using Gmail, you need to connect your Google account to myphoner. Go to your personal preferences and click on ‘Gmail’ under the ‘Email’ tab. Send from the right address: Please make sure you have added the email address associated with your myphoner account under ‘Settings’ -> ‘Accounts’ -> ‘Send mail as’ in your Gmail account if you want to send from that address. If you haven't done this, the emails will be sent from your main Gmail address and not the email address you registered with myphoner. When sending email through Gmail or Outlook 365, you need to add the signature you want to use in myphoner. Unfortunately, we can't use the signature defined in your account even if you have one set up already. 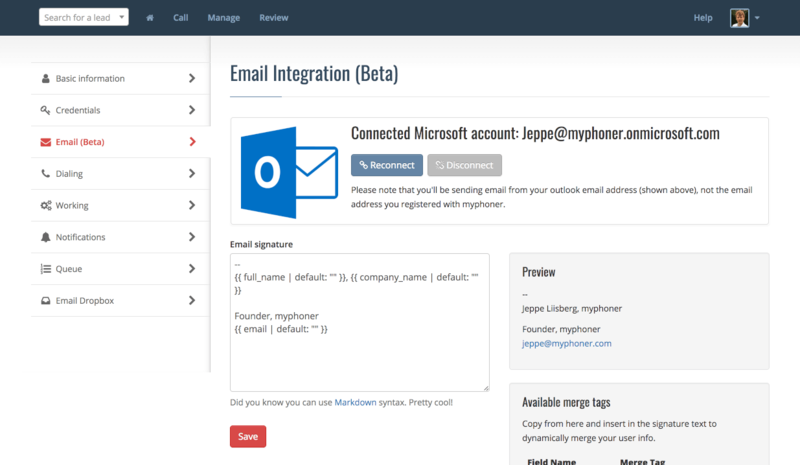 Once you have connected myphoner to your email account, the signature field will be displayed for you to edit. We provide a few merge tags you can use if you want changes to the company name, your name or your email address to automatically reflect in your signature, but this is optional. Pro Tip: When sending emails through Gmail or Outlook 365, we will generate an HTML version of the email. The HTML version is created using markdown. You can read the docs there and experiment with adding links, etc. to your signature. Edit your email signature once connected to an email account. By default, myphoner will open the email in your default email client. The message will be ready to send with the lead’s email address, your email address, your dropbox address and the email content all added by myphoner. You do not have to do anything else; just make sure you have an email client installed locally on your PC or Mac. Choosing a desktop client: If you are using Hotmail, Outlook 365 or any other browser-based email provider, you need a desktop email client that can send through those services on your behalf. There's plenty of clients to choose from though. Here's a recent review of 10 desktop email clients you can install and use free of charge. 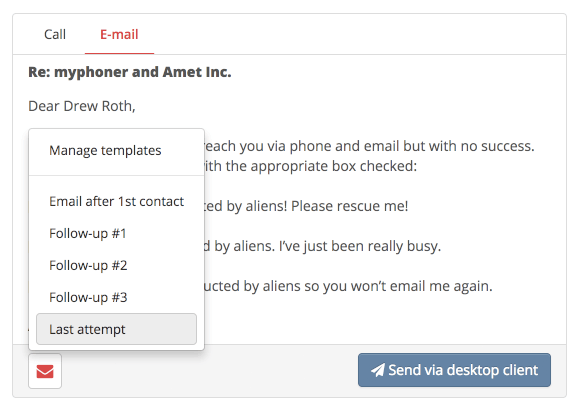 Open an email template in your desktop client for sending.